METHODS. A 6 month retrospective review of open (OPEN) vs. laparoscopic (LAP) colectomy was undertaken. The study was limited to two specific colectomy procedures: Right colectomy (RT) and Sigmoid colectomy (SIG), performed both OPEN and LAP. The following variables were recorded: Age; Gender; Pathology; Use of ALV; time to flatus (POI); length of hospital stay (LOS); 30 day readmission. POI and LOS were compared using Mann Whitney analysis. RESULTS. Eighty two patients were retrospectively studied: Fifty three patients underwent LAP colectomy (13 LAP RT and 40 LAP SIG) and 29 patients underwent OPEN colectomy (17 OPEN RT and 12 OPEN SIG). Of the 82 patients, 30 received pre-and post-operative ALV, and 52 received none (CONTROLS). In the series as a whole, ALV decreased duration of POI (2.4 ± 0.2 vs. 3.4 ± 0.2 days; p<0.005) and reduced LOS (4.4 ± 0.2 vs. 5.8 ± 0.2 days; p<0.005). On average ALV patients were discharged 1.4 days earlier than CONTROLS. Similarly LAP patients had shorter POI (2.7 ± 0.2 vs. 3.5 ± 0.2 days; p<0.005) and reduced LOS (4.8 ± 0.2 vs. 6.1 ± 0.4 days; p<0.005). On average LAP patients were discharged 1.3 days earlier than OPEN cases. LOS in ALV patients was significantly shorter after OPEN RT, OPEN SIG and LAP R colectomy. There was a trend toward shorter LOS in ALV patients after LAP SIG, but this was not statistical significant. The combination of LAP plus ALV was cumulative; LAP RT patients receiving ALV were discharged 2.8 days earlier than OPEN CONTROLS; and LAP SIG patients receiving ALV were discharged 1.7 days earlier than OPEN SIG CONTROLS. Two patients were readmitted within 30 days of discharge; Both were CONTROL patients and were readmitted with recurrent ileus vs SBO. CONCLUSION. The global reduction in LOS in patients receiving ALV undergoing OPEN colectomy is the same as that conferred by LAP surgery. ALV significantly reduces LOS after OPEN RT, OPEN SIG and LAP RT colectomy. ALV patients trended toward shorter LOS after LAP SIG, but this was not statistically significant. Earlier discharge did not result in higher readmission rates. The combination of ALV and LAP surgery is cumulative and resulted in the lowest LOS in the series. 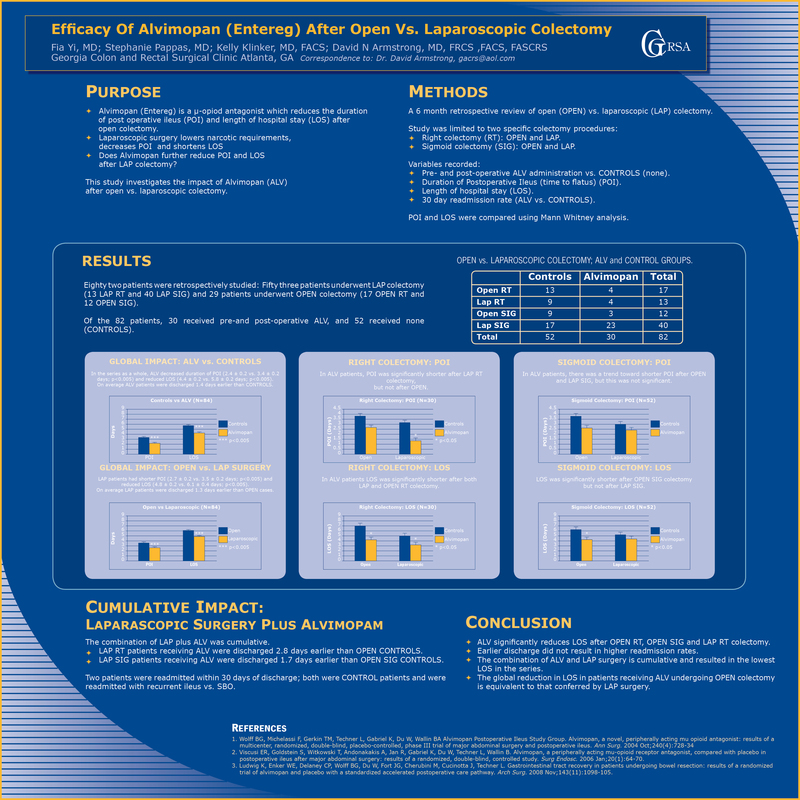 In spite of already shorter LOS and lower narcotic requirements after LAP colectomy, ALV still has a beneficial effect in this group of patients.